Reuters has reported that US private equity giant Blackstone Group LP is in advanced talks to buy a 55% stake in the Financial and Risk business of Thomson Reuters Corp. The deal would value the unit at about $20 billion including debt, Reuters reported, citing three sources. Thomson Reuters’ board, the sources said, is expected to meet on Tuesday to discuss Blackstone’s offer for the F&R business, which supplies news, data and analytics to investment companies and banks around the world. The unit contributes more than half of Thomson Reuters’ annual revenues. Reuters reported that under the terms of the Blackstone offer, Thomson Reuters would retain a 45% stake in the F&R business as part of a partnership with the buyout firm. Thomson Reuters would receive more than $17 billion for the deal, including about $4 billion in cash from Blackstone and about $13 billion financed by new debt taken on by the new F&R partnership. The report said the whole F&R business is valued at about $20 billion, consisting of about $7 billion in equity and $13 billion in debt. 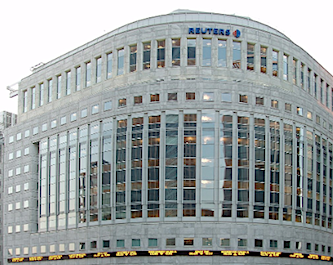 Thomson Reuters would hold on to its international news service, Reuters, along with its Legal and Tax and Accounting divisions.